Systemic Hypertension is high blood pressure in the systemic arteries - the vessels that carry blood from the heart to the body's tissues (other than the lungs). High systemic (or body) blood pressure is usually caused by the constriction of the small arteries (arterioles). This increases the peripheral resistance to blood flow, which increases the heart's workload and raises arterial pressure. Blood Pressure is measured at its highest (Systolic) and lowest (Diastolic) levels. Normal systolic pressure depends on a person's age, but a maximum normal adult reading is around 140 mm Hg (millimeters of mercury). The upper limit for normal diastolic blood pressure is around 90 mm Hg. The term Pulse Pressure refers to the difference (in mm HG) between the systolic and diastolic pressures. The cause of Primary (or Essential) Systemic Hypertension (95% of cases) is unknown. 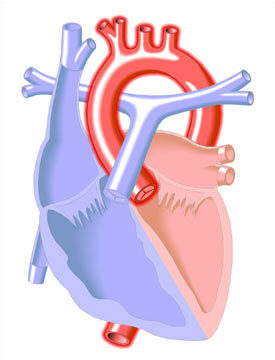 Systemic Hypertension that is caused by another condition or disease is referred to as Secondary. For example, high blood pressure may be caused by a narrowing of the aorta (Coarctation of the Aorta), by kidney disease that involves a narrowing (stenosis) of the renal artery, or by certain endocrine disorders (e. g. Cushing's Disease).